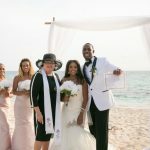 Yet another couple affected by the H1N1 virus, (their cruise ship was not allowed to go to Mexico) they got to spend two days in Cayman and their barefoot beach wedding took place at Mary Molly Hydes beach, which is the quiet end of Seven Mile Beach, Grand Cayman. Here the bride waits to join her groom at the edge of the surf. Part of every ceremony, "You may now kiss your wife!" Our tradition says that the Groom must open the champagne. A quiet moment to reflect on the fact, we're REALLY married! This couple from Orlando, Fl. send their thanks and best wishes to family and friends for their support in making their dream Cayman Cruise Wedding possible. Ceremony by Joy of Weddings, flowers by Trisha's Roses, photos with my Olympus FE 370 courtesy of Sophia Donalds. 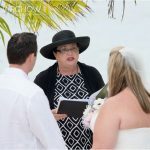 Call me for your beach wedding or vow renewal while in port for the day. 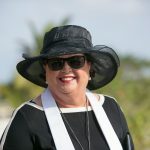 Cayman is the only port on the Western Caribbean cruise itinerary with no waiting period to be married, making it imminently easy to be married here with no fuss. 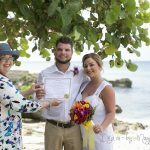 Call Joy, your Cayman Cruise Wedding specialist today +1 (345) 5256551/+1 (345) 9269933 (best for AT&T customers) today or fax (345)945-7954. No hidden costs, we are a member of the Association for Wedding Professionals Internal (AfWPI) and work to their code of ethics.